Many homeowners are unaware of the kinds of exterior remodeling projects that can boost their home’s value and curb appeal. In fact, improving the outside of your house via remodeling not only helps increase your property value but can also be quite a rewarding experience for you and your family. Enhance Your Outdoor Living Space. 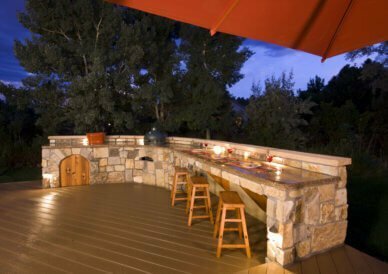 In warm weather climates like Arizona, buyers often want a home with functional, comfortable outdoor living spaces. Some homeowners will add a slate patio or a wooden deck to help enhance these entertainment areas. At Republic West Remodeling, our team of expert designers works hard with our clients to transform ordinary outdoor living spaces into the ultimate oases by adding interesting features, such as pathways and path lights, outdoor kitchens, unique desert plants and succulents, or even water features, such as ponds or waterfalls. Reimagine Your Facade. To help boost your home’s value, consider adding new stucco or siding. While these aspects play a critical role in every home’s exterior, the stucco or siding you select will help to protect your home from the elements. Particularly in areas like Arizona, it is important to ensure that the material you use can withstand the blistering heat without adding significantly to your home’s yearly maintenance. On top of that, consider using a siding material that can not only hold up to the force of the sun’s rays but do so without compromising style or durability. Replace Your Front Door. As a significant focal point of your home’s exterior, front doors can suffer from daily wear and tear. In many cases, homeowners do not notice damage until it becomes serious because holes and cracks tend to start out small. No matter the design of your home, you can choose from different materials, colors, and styles. If you are renovating, consider that a larger entryway can change the entire feel of a home, make it seem more open. Think about installing a bigger door, perhaps featuring window panels on the side. With this approach, you not only increase your protection with a stronger door but also radically enhance the look of your home’s entranceway. Replace Old Windows. Selecting the right windows is vital, and in order to do so, you must be strategic about which type of window replacement is best. Choose the most appropriate style suited for your home’s style, feel, and function. Energy efficient windows have the greatest lifetime value but are not the right choice for every home. Double-pane windows, for instance, may compromise the designation status of historic homes. Nevertheless, energy-efficient windows are an attractive choice for most homeowners because they can lower your energy bills and contribute a greater amount to your home’s resale value. Think About Window and Door Trim Colors. Window and door trim may seem like small-scale elements when you compare them to the rest of your home’s exterior, but they present the perfect opportunity to create visual contrast. While some homeowners choose white or black as trim choices, others go for a more non-traditional look, incorporating bright yellows, oranges, or reds, and even blues, if the house is a neutral shade. Add Some Outdoor Accessories or Art. Weather-resistant artwork can add style and personality to your outdoor spaces. Select pieces that complement your home’s color palette and exterior. Some options might include birdhouses or birdbaths, unique sculptures, or wind chimes. Still Looking for More Home Renovation Information? Remodeling your home’s exterior can be very satisfying and ultimately increase the resale value of your home. The right design choices can add curb appeal and also make coming home each day a more pleasant experience. We are incredibly proud of the more than 17,000 home remodeling projects we have completed since 1995, including outdoor living spaces, home additions, kitchen and bath remodels, whole house remodels, and much more. Contact Republic West Remodeling today for interior and exterior remodeling, as well as home additions in the Phoenix metro and Scottsdale areas.